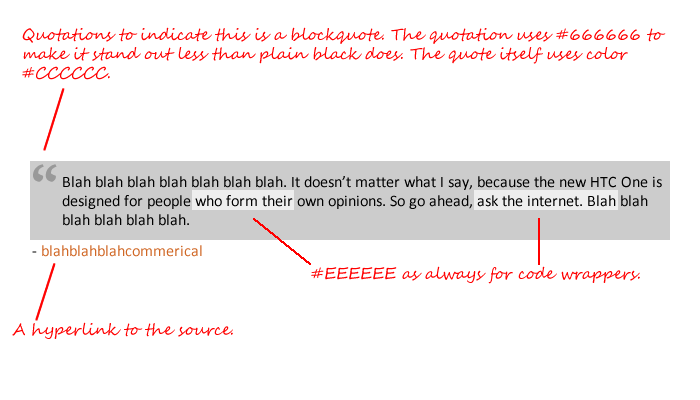 On AskUbuntu there is similar background-formatting for Blockquote text and Preformatted code text. The similarity makes it easy to confuse them. The code sudo apt-get -f install is not easily picked out because of the whole-statement's block-quote format. It should be easier to differentiate these types of formatted text. I'm not asking for it to be exactly like this, but some differentiation is definitely needed here on Ask Ubuntu. It would help with the confusion of formatting code as a quote. These might be too dark. I would suggest that we keep the same colour for the quote, but instead just add the rule along the side. I took the line colouring from the yelow one on Meta.SE- it goes from (33,255,241) to (35,255,199), a change of (2,0,-42) so I did the same with the grey, from (0,0,238) to (2,0,196). These are all HSL colour numbers. This is a quote. This is embedded code. Not much difference. The embedded code background is #dcdcdc. This could possibly only happen when it is embeded in quotes? But a permanent change wouldn't be bad. I think having a different color for blockquotes and code makes sense, because they serve two different purposes. As you've shown sometimes you may have code inside a blockquote, and it would be nice to be able to visibly distinguish it. I would suggest staying away from highlighter colors since to me they say this is the important part not this is the quote, but I might be a bit biased on that since I would actually like to see a highlighter feature implemented. The code wrapper is actually kind of like highlighting except it as well stays away from highlighter colors to distinguish that it's for code. As you can see above, on S.M.F. their postings have a gray background so their quotes have a darker grayish-purple color. This makes them stand back, but different from highlighting which makes things pop out. I'm not saying we should use the same purpeish-gray color on here, because our background is much lighter than S.M.F.'s. AskUbuntu has a white background so perhaps a medium gray would be an equivalent to the S.M.F. strategy? I also think having quotation marks would be an asset to help make it clearer that it is a quote. Currently both blockquotes and code wrappers use #EEEEEE, but I think blockquotes should perhaps be switched to #CCCCCC so they fall back. As seen in my examples below. Please ignore the misuse of the code wrappers, I couldn't think of anything to type. Not the answer you're looking for? Browse other questions tagged support feature-request text-formatting .